Traveling into Jerusalem from the Tel Aviv and Ben Gurion airport areas requires making a choice: either Highway 1, currently under massive reconstruction, or Route 443. That's the route we generally choose: a busy 4-lane highway almost its entire length, that passes Modi'in and works its way to the northern edge of the capital, coming close to Ramallah, where the Palestinian Authority has its base. the pleasant and well-run Dor Alon gas station, an Arab-operated business a few minutes drive south of Modi'in, and one of the two public fueling points on the busy intercity highway. By far most of the drivers pulling in there for fuel or refreshments are non-Arabs. We have been regular customers there for years. Another terror attack was executed at the very same location this afternoon, this time with lethal consequences for one of the victims. A terrorist killed a 20-year-old Israeli man at around 3pm on Monday at a gas station on Route 443, on the same day that a series of other attacks wounded several others, including a Palestinian. 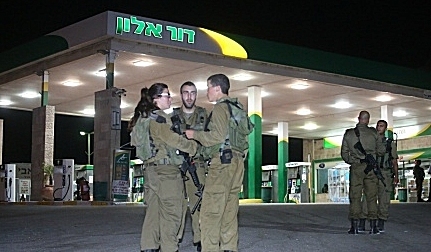 A preliminary investigation showed that the Israeli man and woman had arrived at the gas station when the Palestinian terrorist tackled the driver as he exited the car. The terrorist stabbed and killed the man and lightly wounded the woman. An officer at the scene shot and killed the terrorist. The identity of the young Israeli man was announced around 7 this evening: according to the Jerusalem Post, he is Ziv Mizrachi, 20, a soldier serving in the IDF. Palestinian Arab sources identify the perpetrator of the attack, who was himself shot dead on the spot, as Ahmad Jamal Taha, a boy of 16, from an Arab village in the Ramallah they identify as Qutna. (We can't find a place on the map with that name.) Another teenage killer, whose life will now be celebrated by Palestinian Arab society for the homicide he managed to pull off in the last seconds of his short life. And the second 16 year old Palestinian Arab child-terrorist to have been killed today holding a knife while executing an act of hateful savagery. It's a pathetic indictment of the failed blood-lusting society that nurtured them and that seeks to sacrifice yet more of its children on the altar of their pseudo-political death cult.